Your singers will love this new gospel-inspired peace. The beautiful text uses both sacred and secular imagery to paint the picture of how "we can be the promise of peace." The powerful piano accompaniment, and rocking cappella section really set this piece apart! Perfect for concerts themed around peace and social justice. A hilarious arrangement of this traditional tune for your treble ensemble. Fun and silliness are in store as singers add movement, props, and comedy vignettes. Complete with sound effects and musical quotes of famous themes, this piece will have your audience in stitches! A majestic anthem for your church choir. This setting of the beautiful poem by the South African activist Alan Paton would be a wonderful pairing with any message of service, unity, peace, or social justice. The addition of brass quartet and timpani (optional) make this a powerful, and moving anthem. 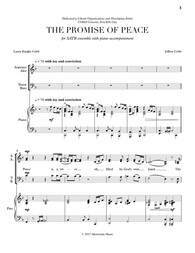 This piece will become a favorite of your choir and your congregation.